Why do our fingers wrinkle when wet? According to the tests results fingers wrinkle when wet, to allow a better grip on wet objects, like the car tires in the rain. 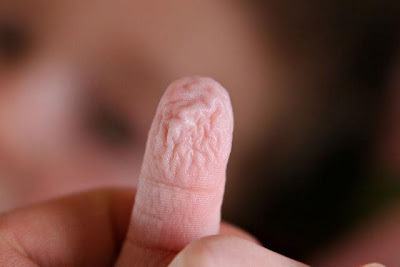 “In this study, we show that submerged objects are handled more quickly with wrinkled fingers than with unwrinkled fingers, whereas wrinkles make no difference to manipulating dry objects.” The wrinkles that occur in skin after prolonged exposure to water are sometimes referred to as pruney fingers or water aging. This is a temporary skin condition where the skin on the palms of the hand or feet becomes wrinkly. This wrinkling response may have imparted an evolutionary benefit by providing improved traction in wet conditions. In the recent past the common explanation was based on water absorption in the keratin-laden epithelial skin when immersed in water, causing the skin to expand and resulting in a larger surface area, forcing it to wrinkle. Usually the tips of the fingers and toes are the first to wrinkle because of a thicker layer of keratin and an absence of hairs which secrete the protective oil called sebum.